For some people, Bermudagrass is a healthy, vibrant, and desired grass for your lawn. For other people, it is an invasive, pesky, and unwanted addition to their lawn. We are going to focus on the latter. In the southern regions, Bermudagrass is a very common and popular grass and it thrives and stays green for the majority of the year. However, in the northern regions, it will go dormant and grey/brownout much sooner than other grasses such as fescue and ryegrass that handle the cold weather much better. This will give your lawn a patchy and uneven look. The first step to controlling and eliminating the unwanted Bermudagrass in your lawn is correctly identifying it. The best time to apply any kind of selective herbicide is while the Bermudagrass is actively growing from early spring to late fall. There are a few amounts of selective herbicides that are effective and are dependent on when, where and what grass you apply it on. If you are treating in areas such as trees, shrubs, and perennial beds we recommend to use products such as Grass Getter, Ornamec 170, and Fusilade II. In northern grasses such as Bluegrass, Fescues, and Ryes we recommend a broadcast application of Acclaim Extra or Monterey'sTurflon Ester. Be sure to always read the label and determine which kind of turf you have before applying. Many of these herbicides will take multiple applications across multiple seasons to properly eliminate your problem. You can apply these chemicals with any hand pump or backpack sprayer. We have some available here. When applying non-selective herbicides, you want to be sure not to mow beforehand. You want as much service area to absorb the chemical as possible. Remember that most non-selective herbicides are systematic and will destroy any vegetation it comes in contact with so be very careful when applying. Apply 3-4 weeks after first application and then you can plant your desired vegetation to help prevent farther growth. With every application, we recommend using a surfactant such Monterey's Herbicide Helper. This will help the chemical get absorbed into the plant. We recommend products such as: Gly-Pho-Sel Pro Dry 75 SG, Roundup Quikpro, and Eraser Max. 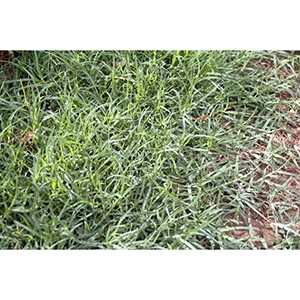 Unlike most grassy weeds, there is no magic chemical that can prevent the growth of it. The best way to prevent it from taking over your lawn is to keep your desired grass happy. If Bermudagrass is an invasive grass in your lawn then the best thing you can do is make the conditions undesirable for it. Making it undesirable could mean anything from the length you cut your grass. Bermudagrass prefers a lower cut grass so if you cut your grass around 2-4 inches, it takes away some of the much-needed sunlight.